The Common Core calls for greater rigor in schools, and I couldn’t be happier about it. I’ve said time and time again that we don’t give kids enough credit, and in my opinion, kids deserve a rigorous, but supportive environment, one in which they can be challenged to their fullest potential. But what does this word “rigor” really mean? I think this idea of “rigor” would be rather difficult to capture within a 500-word post, so it might be a bit easier to say what “rigor” is not. Rigor is not more work. Too often, when kids finish early, we try and find ways to give them more work to keep them occupied. We might even put more problems on a worksheet in order to challenge them. While rote practice has its place in the classroom, more rote practice isn’t any more challenging; it’s simply more rote practice. If students are completing the rote practice that quickly, it’s clear they need something deeper to grapple with. Try reading this with your kids multiple times, providing little clarification with the message or details of the poem. You’ll be surprised at how much they uncover with each reread. Rigor is not (necessarily) a longer text or a higher Lexile. This goes along with the first one. Just because a text is longer and more quantitatively complex, doesn’t necessarily mean it’s harder. 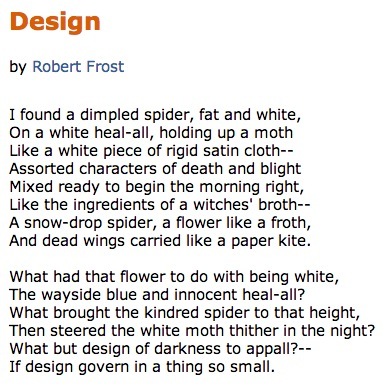 One of my favorite poems to read with the children is “Design” by Robert Frost. It’s a short sonnet, rich with imagery and conducive to many close reads, each time allowing students to uncover different meaning. In fact, I think it was one of the most valuable texts during my poetry unit in 4th grade. Of course, as students grow older, we want to expose them to longer texts, as the length of a text can be one component of rigor; however, it is not the be-all-end-all and should not be seen as such. Rigor is not (always) the next grade level. In our mastery learning era, we are undeniably tempted to move students on to the next set of standards once they’ve “mastered” the current grade level, but this begs two questions: (1) How do we know they’ve truly “mastered” the grade-level content? One summative assessment? and (2) What is the purpose of this? Is it just to raise a test score? I’ll admit, the systemic constraints are rather contradictory, as we are administering adaptive, growth-based tests that leave us with no choice but to continue teaching subsequent grade levels of skills, confusing the true meaning of “rigor.” However, make no mistake, this is not rigor; this is merely an exacerbation of the “mile-wide, inch-deep” calamity. Can you use higher grade levels to inform your enrichment? Of course. However, should that be your go-to for enrichment? Most certainly not. Instead of the aforementioned, try providing higher level questions and tasks that require synthesis, evaluation, and creation, and allow the students to have a hand in the inquiry. This enhances the learning process, and makes it much more rigorous and self-directed.